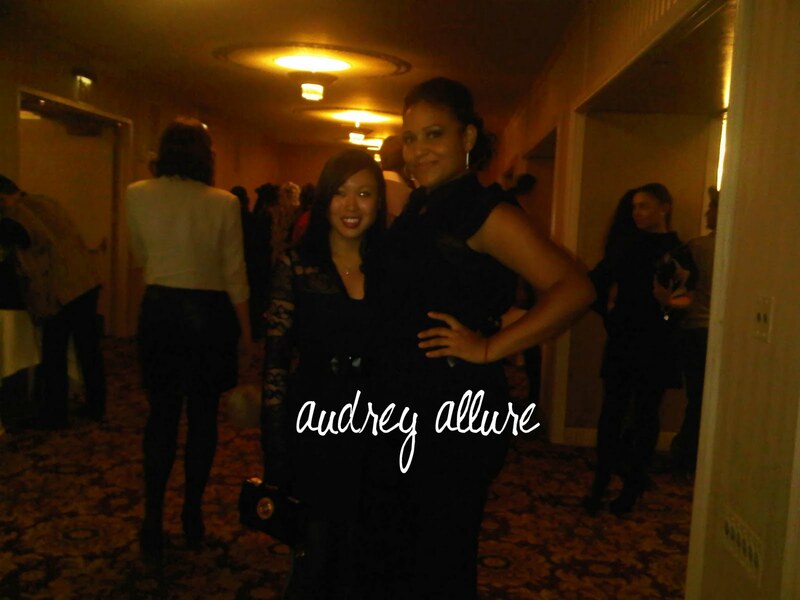 Audrey Allure: The Rest of My NYFW ! The Rest of My NYFW ! The 4th day of NY Fashion Week, I attended the D'Angelo show at the Waldorf Astoria. 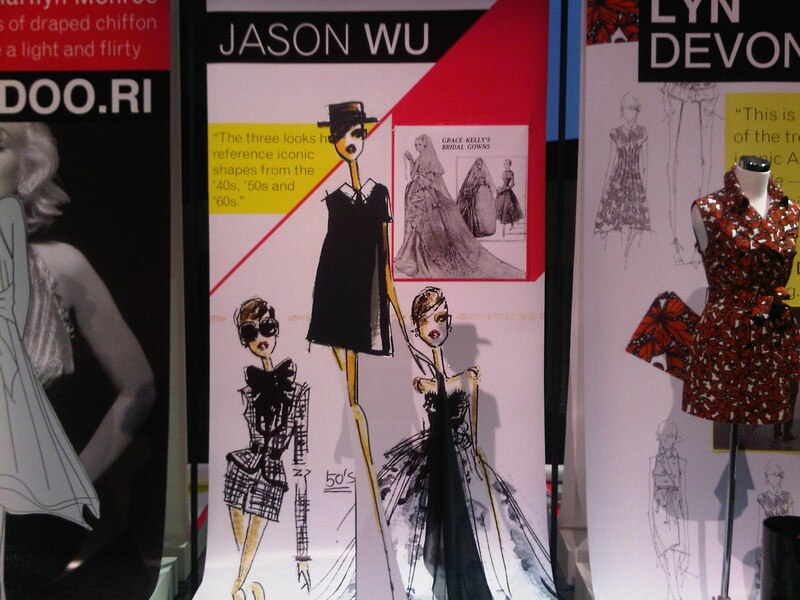 The show was benefitting Fashion for Autism and guests may auction for artwork. My friend Francisca got me a seat in 2nd row :) Before Edwing D'Angelo's collection, there were two other designers showing theirs. I unfortunately did not get the first designer's name, but I thought the collection was pretty bad anyway. The second, was beautiful! Luis Machicao designed beautiful Mad-Men/Audrey Hepburn inspired pieces - so classy and chic but some of the pieces seemed to touch a bit costume-y. Then D'Angelo presented his, and Bria Murphy (Eddie Murphy's daughter) along with Sammy Sosa's daughter & Vanessa Simmons walked the runway. We walked away with giftbags, and I went to eat at Pop Diner after - BEST penne ala vodka I've ever tasted! I had classes all day on Monday so I wasn't around and I skipped a presentation at night because I was so tired. Tuesday I was already exhausted & was busy working & I also skipped the Toni Francesc show, which I heard was amazing! (I suggest you check out the collection on Style.com :) ) On Wednesday, I had classes all day. 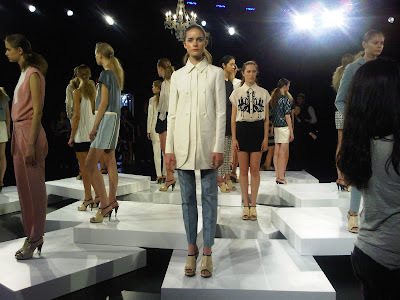 After, I attended the Davidelfin show and was sitting in the 3rd row. The collection was interesting - his theme was "Tautology". According to the program it is, "repittion of a same thought expressed in different ways. The need of protection is the main concept to be used. Search of shelter, security and fastening. Unions, separations, displacements, twists, and grafts. Destroy and rebuild." Overall, I like a couple of pieces (mainly from the female outfits). However, I felt the collection looked like a mix of waiters/scuba divers/flight attendants. The outfits were well tailored though, but the one sleeved jackets seemed unpractical. Below is a video I've uploaded onto Facebook of the finale walk. During my break, my friend & I visited the WWD presentation exhibit across the street at the David Rubenstein Atrium where 11 designers (Adam, Alexandre Birman, Dana Lorenz for Fenton/Fallon, Doo.Ri, Jason Wu, Kimberly Ovitz, Lyn Devon, Marchesa, Prabal Gurung, Proenza Schouler, and Thakoon) re-imagined iconic looks from the last century in honor of WWD's 100th anniversary. 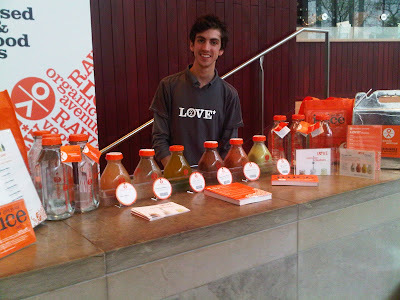 My friend & I also sampled some amazing, healthy & all natural drinks from Organic Avenue across the street at Alice Tully Hall. At night, there was a CRAZY thunderstorm. I heard the rain pounding on the tents but I had no idea how intense it was until I was going home. There were traffic/train problems, roads closed, power outages, and tons of trees that fell. It took me about 2-3 hours to get home when it usually takes me less than an hour driving. So glad that my house has power and that no one I knew was hurt. Oh my Audrey great seats you got there...lucky girl!!!! Gosh you lucky lady getting to experience that! The show at the Waldorf-Astoria looks amazing! That all must have been a blast! 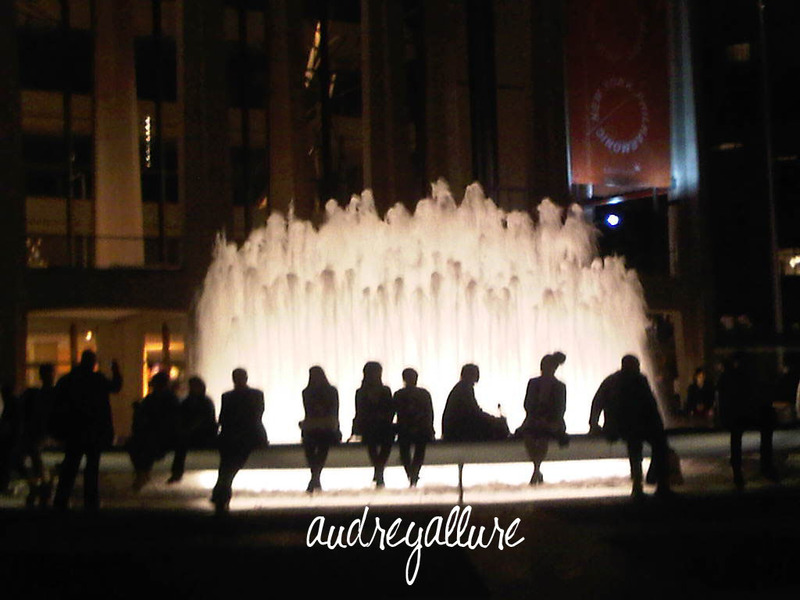 Thanks for sharing more of your Fahion Week adventures, Audrey! 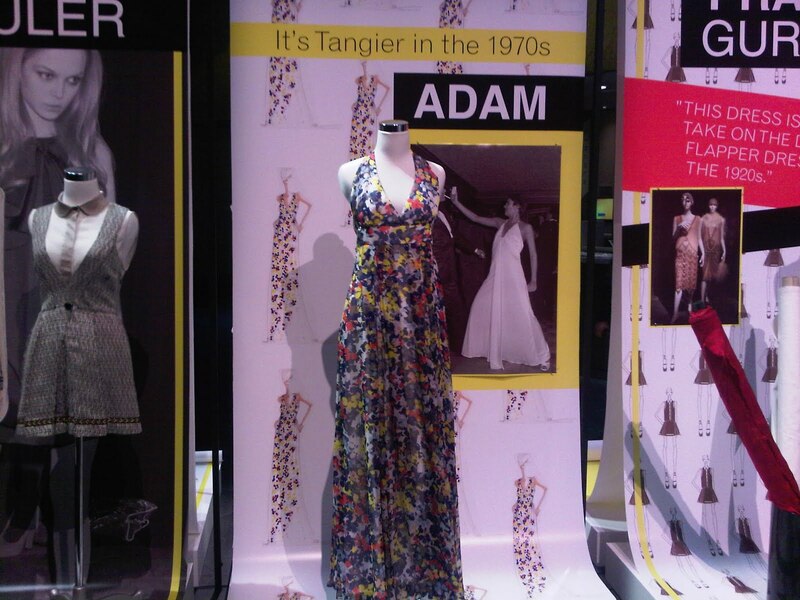 Yes, pls, I would love to see more pics hehe I'm with ya, I'm loving the Andy & Debb collection, as well! Great pictures! thank you so much fo sharing! I LOVE the collection from andy & debb! I'm SO jealous that you had so much fun at NYFW! Such gorgeous collections for spring this year. i envy you , you can attend the event like NYFW . thank you for ur comment in my blog, please check my new post and leave ur comment again. Wow! You got some great seats at the shows. And you seem to be having loads of fun too! Hope you get some rest. the pictures are amazing. How so very exciting! And swing dancing sounds like such fun and I can't wait to see pictures of that! You'd be such a pretty swing dancer. so cool that you got to go. i think those first dresses look like prom dresses...maybe that's just me. but it's so great that you were able to partake in all of this. thanks for the video too. Sounds like an amazing week. I love the last photo. So jealous! I love the Texas sun but there are plenty of times I wished I lived in NY! Sounds like it was an incredible weekend! i'll be following you on twitter!!! i love your whitney port's pictures too, SO ENVOUS! You are one lucky girl, this is a brilliant post! Some really lovely outfits, great pics. Thanks for sharing Audrey, a job well done. Well done you! Great shots! Really glad you had a good time! Fashion Week is exhausting right? But once it's over, you kinda want it to start all over again! Great designs! You must have had so much fun, I'm not surprised you are exhausted. u are so lucky can attend the NYFW. What a great round up! Looks like you saw some really beautiful spring fashions! How fun!! It seems that you were busy throughout fashion week! Lots of great shows and pics! You lucky girl! Such a blast of fashion... I liked imbibing myself into the different concepts. Tautology... fashion pop art! Yummy like pop tarts! great collections and great shots!! The D'Angelo collection is beautiful!!!! What a marvelous post! Loved all the pics! 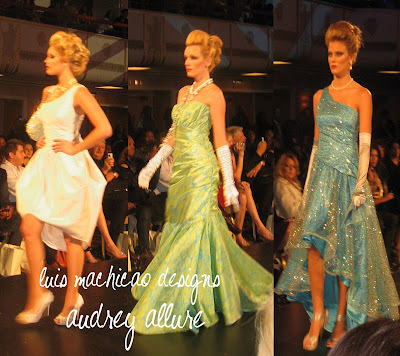 My faves were the Machicao collection - just gorgeous! Looks like you had an amazing fashion week! wow.. casual theme I think..